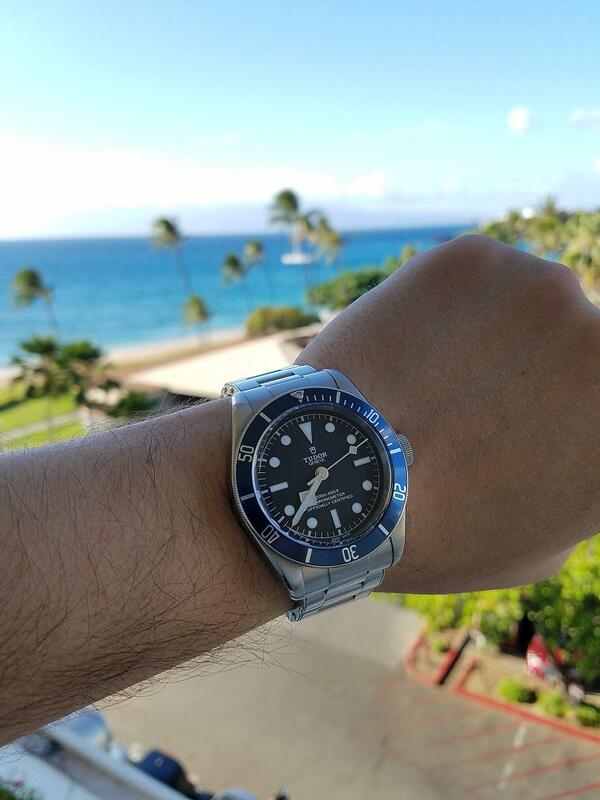 TimeZone : Tudor » Black Bay owners - How accurate is your BB? I love the look of the Balck Bay, but I'm wondering about how well they keep time. Your feedback would be appreciated! I have the older model Black Bay Red and it has been spot on since I purchased it about 6 months ago...literally within 2-4 seconds a day. I could not be more pleased with it and chose it over the newer model. Many things I like about the older vs. newer one. mjm2, can you elaborate on why you prefer the older model? I'm really interested to know why...thanks. I like the "smiley face" wording on the dial much better than the straight horizontal text on the newer model. To me the curved text flows better with the curve of a round dial. I'm also not a fan of the pronounced rivets in the new bracelet. I like the cleaner look of the older bracelet. When I purchsed mine I also got a good price since the new model was already out, so everything worked in my favor. I'm sure others will point to the things I've mentioned as positive reasons to buy the newer model. In fact, Breitling was probably counting on it. I'm sure you'll enjoy either. One more thing I favor is the Tudor rose on the older model. Hated to see that go. However, the in-house movement with longer power reserve was enticing in the newer model, but the retro look of the original carried the day for me. I also thought I would go with blue or black, but once I tried on the red, it was a done deal. Red was it for me. It's now one of my favs. ..on the 1st-gen version of this watch. I haven't timed it lately, but I don't recall any accuracy issues, and the ETA movement is well-regarded among experts. Recent purchase, in house blue model. Most accurate watch I have ever owned, -0.5 seconds per day on average over the past month.